5 reasons to buy a used car instead of a new one! It’s always better to buy a new car instead of a used one. But sometimes, there are compelling reasons why you must also look at a used car. 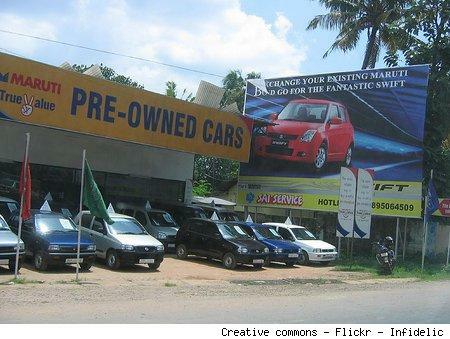 CarToq lists five of these reasons when a used car makes more sense than a new car. When the time comes to buy a car, how do you decide whether a used car is a better option or a new car? Obviously, the first thing that decides what car you will buy is your budget – how much you are willing to spend on acquiring a depreciating asset. And sometimes that budget isn’t enough. – If you want a bigger car for instance and have a budget of only Rs. 4.5 lakh. You won’t get any of the new sedans within that price, but you could get a five-year old used entry-level sedan for that price. Cars like the Maruti Swift Dzire or a slightly older Maruti SX4 or even a Honda City of about seven year vintage will come within that price bracket. – If fuel costs are a problem and you just have to buy a diesel car with a limited budget of Rs. 4 lakh. You won’t get a new one, but you will get used diesel hatchbacks like a three-year old Ford Figo diesel, Maruti Swift diesel or even a slightly older Fiat Punto diesel. – If you want to buy an automatic sedan or hatchback, but are again limited by budget. You will get used automatic sedans like a four-year old Honda City automatic for about Rs. 5.5 lakh. For about Rs. 1 lakh more, you may even get a six-year old Honda Accord automatic! – If you are buying a second or third car in the family for a young family member, like your college-going son or daughter, and don’t want to spend too much on it. Good first car choices are used Maruti Swifts or Hyundai Santros, which live up to the “cool” factor, and are not expensive to maintain. Also read: Can you convert a petrol automatic to CNG or LPG? Another compelling reason to buy a used car is if you are a new driver, having just learned to drive. Until you get confident enough with a car, it’s better to use a used car, because there may be the occasional scratch or two that will pinch hard if it happens to a new car. Ideally, if you’ve just learned to drive a car, buy an easy-to-maintain used car that has low replacement parts cost and use it till you feel confident enough to drive a more expensive, classier car. One can get used Santros, i10s or Swifts for about Rs. 3 lakh or less. Stick to brands like Maruti or Hyundai which have low replacement part costs and can be repaired just about anywhere. If you have a job that involves frequent medium duration postings to various cities or even having to go abroad after a year or two at the local office, it makes sense to buy a used car in the city where you work. If you buy a new car, you will lose a lot of money if you sell it within a year or so. New cars lose about 10% of their value the moment they drive out of the showroom. And in two years, you may be down to 75% of the value of the car. Buy a reliable, easy-to-maintain brand which has good resale value, so even if you use it for a year or two and sell it you won’t lose much on its value. Among sedans a Honda City holds its value very well. The Wagon-R is another that holds its value among hatchbacks and is a reliable car. Also see: Best used cars for enthusiasts! Another compelling reason to buy a used car is if you want to do something special with the car you own. This includes customization and modification for specific purposes. Buying a new car and carrying out any kind of modifications may void the warranty, and hence it’s better to do such modifications on a used car. – If you are an avid off-roader, but don’t want to spend too much cash buying a new off-roader like the Thar, you can buy a used ex-army jeep and do it up just the way you want it. – If you like motorsport and want to take part in rally events or autocrosses that are organized in your city, you could buy a cheap used car and spend some cash on doing it up to the specifications you want. – If you are a fan of classic cars and just must have something different parked in your garage, you really have no choice but to buy a used car – like an old Volkswagen Beetle or even a Hindustan Contessa Classic. Share your thoughts on any other occasions where you think it’s better to buy a used car than a new one.